Blowout Sale! Save 51% on the Roleadro Dual-head LED Grow Light, 10W Detachable High-end Grow Lamp Bulbs Desk Clip Plant Grow Light,360 Degree Adjustable Gooseneck,Double on/off Switch,for Indoor Hydroponic Plant Office Greenhouse by Roleadro at Halo Grow Box. MPN: HY-SXZJ+5WRB-2*10-US. Hurry! Limited time offer. Offer valid only while supplies last. 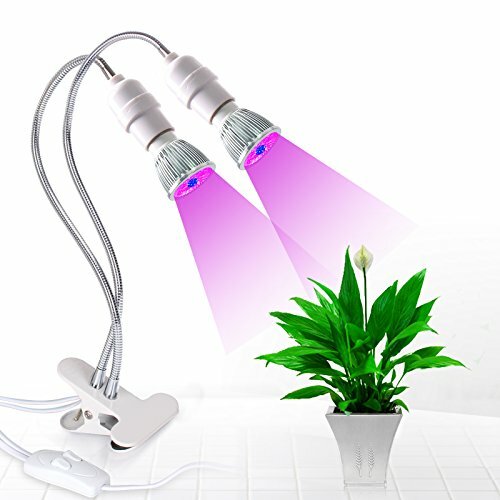 The led plant light set include 8pcs 630nm high-end red light and 2pcs 470nm high-end blue light, provide Indispensable light for plant growth, and provides accurate wavelengths of red light and blue light, efficiently promotes the flowering and fruition of plants and the growth of roots, stems and leaves. Boosting the growth of plants in maximum efficiency. 360-degree flexible adjustable goose-neck allows you to place the light in any direction to provide the best lighting angle to your plants. Which helps the plants bloom and grow leaves and seeds in perfect health! Double switch control. The plant lights equipped with two heads can cover a larger area base on the 10W ( 5W + 5W ) light source, and each lamp head be controlled by a switch independently, you can turn on 1 or 2 head together depending on the circumstances. Roleadro recycle series plant light. You only need to replace a new E26 bulb once the bulb is broken. And the replace lamp can be used as a desk lamp/night light/ newly plant light again. Extend the life of this grow light, save your money and improve resource utilization. Where can you use it? This led grow light lamp can be widely used for office, family balcony sowing, indoor potted plant, darkroom, seedling, gardening, greenhouse, especially in the rainy, snowy, cloudy days while the plants need extra light. It can help your green plant color bright, flowers more colorful, fruit better harvest. If you have any questions about this product by Roleadro, contact us by completing and submitting the form below. If you are looking for a specif part number, please include it with your message.